Recently, my neighbour upset me. I have discovered that he plans to somehow improve his trebuchets to throw nasty things across the river. I told him that my pig-mounted cavalry will attack him. I don't have any pig-mounted cavalry... yet! Is it possible to have a pig-mounted cavalry? If adults are too heavy, I can send children and dwarves to battle. I want a minimum of things (otherwise I would have sofa mounted cavalry, much more comfortable): walking on wanted direction, don't flee when the enemy is there, and even charging them if possible. Is it possible? Most megahog photos feature dead hogs and hunters. 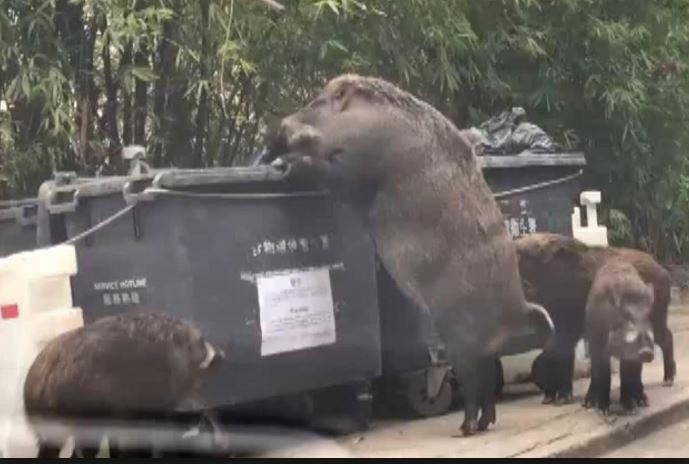 I like this image because the big pig is alive, using its height for some good dumpster rummaging. His ladies wait nearby to see what he will retrieve. I am interested to see that the dumpsters are lashed together; probably his first trick was to tip the whole thing over. So too your pig cavalry: you will use seriously large hogs, 12 feet long and a half ton. Lesser hogs (sans rider) come along as well; your enemies better not be too distracted by the big boy because there are a lot more of these groin level ones in the pack. It will be like the scene from Princess Mononoke. Don't forget the hog war paint. Reference has already been made to the bear cavalry we encountered a couple of years ago. In this case, it's not so unreasonable to ride pigs, though the majority of people don't have a particularly good time of it with the pigs demonstrating their remarkable turn of speed. Easy to feed. Pigs are omnivores, they'd be quite happy to scavenge on the battlefield after the event. They'll feed the troops. Men are usually loathe to eat their horses in times of need, you may find them far more willing to eat their pigs. Pigs are really quite dangerous in their own right. No real mass advantage. One of the great strengths of horse cavalry is the added mass of the horse driving behind the lance on a charge. A tendency to eat the dead and wounded if not adequately controlled. Pigs are really quite dangerous in their own right and in times of stress it may be hard to control who they direct this against. Pigs are dangerous animals. My dad had a friend who was a hog farmer, and he never let us kids get near the hogs when we visited. Just Google "pig attack statistics" to see a long list of incidents where pigs killed people. These lists usually include other livestock as well, but pigs are always specifically mentioned. Pig Bites Man - How often do livestock deliberately kill farmers? BTW, when you are near a large pig that isn't happy about something, the last thing you think is how pink and cuddly this animal is, who is squealing, thrashing, and generally being violent. Just ask any farmer or veterinarian who has had to vaccinate hogs! As a pre-teen, I would sometimes jump on the back of the ram I had and "go for a ride". The ram was smaller than some pigs I've seen at fairs and other farms, and this ram had no problems taking off at a run with me on his back. Trained correctly, a pig could definitely be an alternate to a horse. And yes, pigs are pretty smart. Just don't fall asleep too near the pen, or you might wake up to being chewed on! I'm going to disagree with a lot of people here and say that, while not impossible, it would be very very difficult to use pigs. Pigs aren't runners the way horses and camels are. Yes, pigs can run and they can run fast, but only for short bursts. A true cavalry involves long rides, gallops, etc. Regular pigs aren't suited for this. Pigs of sufficient size will be very wide making them difficult to saddle. No, not impossible to saddle, but more difficult. A proper saddling allows the rider to be stable at many different run speeds. As many have pointed out, pigs can be quite fierce. In many ways, this is a negative. A cavalry horse is not used for fighting, it is used for transport. A horse certainly could buck and rear but that is generally not a good thing as it makes it much harder to ride. A properly trained cavalry horse is trained not to do these things. The rider needs to be able to control the mount not just hold on for dear life. The ferocity of a pig (or herd of pigs) would lend itself well as an attack force, much like a pack of attack dogs. Your pigs could be used this way rather than as mounts. This would still take considerable training as they would need to be "unleashable" without turning on your own forces. Honestly, dogs would be easier for this but pigs are very smart and it should be possible. All this said, a pig mounted cavalry might be possible if the correct bread is found (or created). You may be able to breed in the traits necessary to overcome the above issues. If successful then they could certainly become quite formidable. I think that the main issue here is how well a pig could be trained to do that job. As the other answers have established, they are big enough, mean enough, and intelligent enough to do the job, but I do not know if they can be trained to do so. A pig may or may not be interested in responding to commands, at least not reliably. You may be able to train one to carry you into battle, just to have it throw you off and run away when things get unpleasant, making it ineffective. Horses by nature are herd animals and are amenable to taking commands from a human, and can even be trained to obey when you're telling them to do something they would rather not do. Zebras, on the other hand, do exist in herds, but are much more individualistic and are very opposed to taking commands from people. They'd much rather kick, bite, and trample humans that attempt to ride them. There have been many attempts to use zebras like horses over the centuries, and those attempts failed. Zebras simply won't cooperate. So it's hard to know without further data whether a pig is more like a horse or more like a zebra. Chances are is that it's somewhere in between, but more data is necessary. Your best option is chariots pulled by pigs. Pigs are fast and strong, a couple of them probably can pull a chariot with one soldier. You can put armor over them. At least padding against arrows. 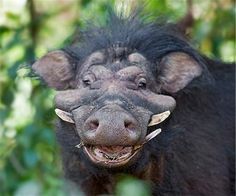 Attacking a pair of screaming of wild pigs with tusks isn't easy. Special spears to keep the animal at a distance had to be designed but they didn't factor for human intelligence (with throwing weapons) behind the pigs. You need to spend at least a couple of pigs for chariot. A strong shield wall can stop you. You need to be highly mobile. Chariots are counted as mounted cavalry in warfare, but I don't know if you like calling them that. You can add scythes to the wheels. Carnage is always welcome. History used horses for cavalry most of the time. Elephants have been used, but their success is much more mixed, and they were much more easily countered. So the real question is: why were horses so much more successful than any other animal? Pigs have a lot going for them. They can be large. They can be dangerous. They are certainly intelligent and thus trainable; pigs are probably more intelligent than both horses and elephants. But what made the horse successful was a combination of size, courage, and loyalty. You can think of them almost as large dogs. Very few animals would rush into a line of pikes just because their human asked them to, and a pig isn't on that list. One of the reasons that elephants became unsuccessful cavalry is that opponents realized that, if you gave elephants the option of escaping or charging the line (for example, by intentionally putting a hole in your ranks), the elephant will choose to escape. Most animals will choose survival over following commands. The horse would do whatever its master asked. Pigs are more like elephants than horses. While I think there may be much more to debate on how well they can be trained or how easy they are to ride, I wanted to help find a usable species. According to livescience.com, you have a few choices. The Giant Forest Hog can grow up to 6' 11'' long, 3' 7'' tall, and weigh up to 606 lbs. Your second choice is the Eurasian Wild Pig. These grow up to 6' 7'' length, 3' 7'' tall, and up to 711 lbs. Pigs are very intelligent and have their own unique personalities, so, while I've seen some pigs trained to do tricks, I'm not sure they could be trained to be ridden like a horse unless they have a willing personality. They might be unreliable, like trying to ride a mule into battle. But there are some accounts that in ancient Rome they used war pigs against armies that used elephants... by setting the pigs on fire and letting them loose to terrify them, and they would then trample the opposing army while trying to flee. Not the answer you're looking for? Browse other questions tagged warfare medieval fauna or ask your own question. Stopping a cavalry charge by destroying the ground in front of it? Would a hill covered with 10,000 dead rabbits and soaked with 5,000 liters of wine present an impediment to charging horse-mounted cavalry?